A multimedia feature published this week in the New York Times, “Pushing Science’s Limits in Sign Language Lexicon,” outlines efforts in the United States and Europe to develop sign language versions of specialized terms used in science, technology, engineering and mathematics. The article shares newly defined signs for terms like “light-year,” “organism” and “photosynthesis.” It also describes a successful crowdsourcing effort started at the University of Washington in 2008 that lets members of the deaf and hard-of-hearing community build their own guide to the evolving lexicon of science. 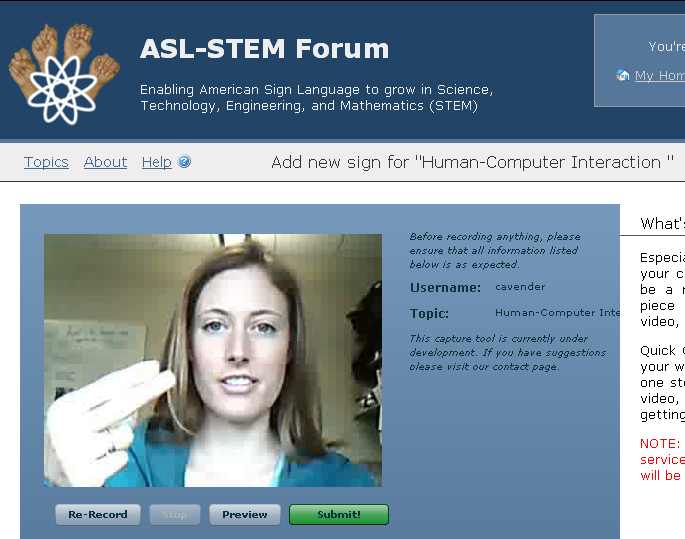 A screen capture from the ASL-STEM Forum. A scientific and technical dictionary for American Sign Language has existed since the late 1990s. It is called Science Signs Lexicon, launched by Harry Lang, an early proponent of science in the deaf community and a professor at the National Technical Institute for the Deaf at Rochester Institute of Technology. But a dictionary can’t include the newest terms, Ladner said, and many graduate students won’t find the specialized terms used in their chosen fields. For example, Ladner helped organize a 2008 workshop where a deaf scientist said only about one-quarter of his field’s specialized terms existed in his native language, American Sign Language, or ASL. Many workshop participants reported that at some point they had had to work with their interpreters to develop their own code words. 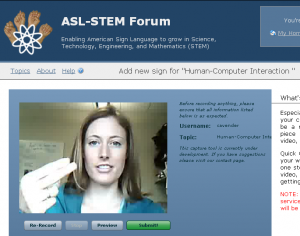 That year, with funding from Google Corp. and the National Science Foundation, Ladner’s group launched the ASL-STEM Forum, an online compilation of signs used in science, technology, engineering and math that is more like Wikipedia or the Urban Dictionary. The site lists 6,755 terms from biology, chemistry, engineering, math and computer science textbooks. Of those, about 2,800 have video entries, some with multiple entries. Partnerships with the country’s two largest higher education institutions for deaf and hard-of-hearing students have helped provide content. 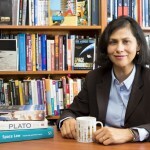 Collaborators include Caroline Solomon, a UW alumna and biology professor at Gallaudet University in Washington, D.C., and Lang and Raja Kushalnagar at Rochester’s National Technical Institute for the Deaf. Anyone can visit the forum, but to add signs a user must create a free account then record a short video using a computer’s camera that can be reviewed and uploaded. People also can rate and comment on signs uploaded by other users. Ladner hopes the recent article will spur interest and encourage people to suggest more entries among the remaining terms. He is seeking funding to update the site, and hopes it will reach critical mass among ASL speakers in scientific and technical fields. Between 2006 and 2010, U.S. institutions awarded 301 doctorate degrees in STEM fields to people who are deaf or hard-of-hearing, Ladner said. Because that number includes hard-of-hearing, the number of science PhDs who use ASL is likely much lower. Many members of that community are geographically scattered, and to make matters worse, American Sign Language and British Sign Language have their own technical lexicons. Now working on the forum at the UW are Kyle Rector, a doctoral student in computer science and engineering, and John Norberg, a UW undergraduate in math who is minoring in ASL. Early members of the UW team include computer science and engineering doctoral students Anna Cavender, now working on accessibility projects at Google, and Jeffrey Bigham, now an accessibility researcher at the University of Rochester in New York; and former UW undergraduates Daniel Otero, Michelle Shepardson and Jessica Dewitt. 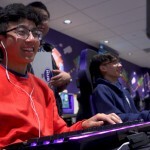 Ladner runs a national summer program to encourage deaf and hard-of-hearing students to pursue careers in computer science, and he leads AccessComputing, a larger UW-based national effort to encourage people with disabilities to pursue computing fields. His group is also involved in a number of research projects that combine computing, mobile technology and accessibility. For more information, contact Ladner at 206-543-9347 or ladner@cs.washington.edu.